Chinese food has an interesting history. All Chinese dishes derived from one of the four categories (known as the Four Major Cuisines 四大菜系): Shangdong Cuisine 魯菜, Sichuan Cuisine 川菜, Canton Cuisine 粵菜 and Huaiyang Cuisine 淮揚菜. With all the transformations and revolutions of Chinese history, regional locals argued that the Four Major Cuisines 四大菜系 did not umbrella all food categories in the country. Later, the term of Eight Regional Cuisines 八大菜系 was initiated, adding Fujian Cuisine 閩菜, Zhejiang Cuisine 浙菜, Hunan Cuisine 湘菜 and Anhui Cuisine 徽菜 to the original mix. Nowadays, those who truly know and understand Chinese cuisines would argue that the four regional add-ons actually falls within the original Four Major Cuisines 四大菜系. Why? Because historically, the original four were divided by regions, forming northern Shangdong Cuisine 魯菜, western Sichuan Cuisine 川菜, southern Canton Cuisine 粵菜 and eastern Huaiyang Cuisine 淮揚菜. Blah, blah, blah, let's get back to the food. The first thing I ordered was something I always order whenever I visit this noodle joint, the Fried Cutting Noodles with Pork, Woodear Mushroom, Egg 木須肉炒刀削麵. Blame it on the poor translation, properly speaking, these noodles were "shaved noodles 刀削麵" not "cut noodles 刀切面", as the two are quite different in texture. The noodles were al-dente, with a firm yet springy texture. 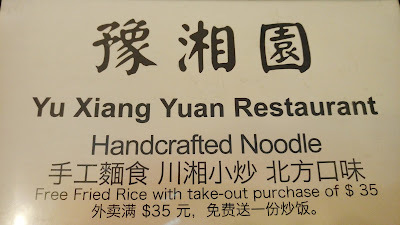 The noodles were not the best I had in 604, but it's near the top of my list. Simple sidekicks of pork, egg and woodear accompanied the noodles in a basic soy sauce blend made this homey dish fulfilling. 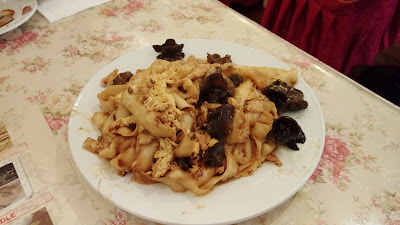 Classically, everything on the plate (other than the noodles) should be cut match-stick thin to showcase "mushu 木須" strips (julienne/allumette), however, that has been quite difficult to find locally. Next came Buddha Boy's Dan Dan Dragging Noodles 担担拉麵. The version here incorporates Sichuan's dan-dan 担担 sauce (chili oil, ground pork, Szechuan peppercorn, peanuts, etc.) 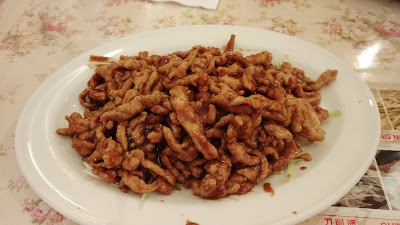 and Shandong's zha-jiang 炸醬 sauce (sweet bean paste, ground pork, ginger, etc.). 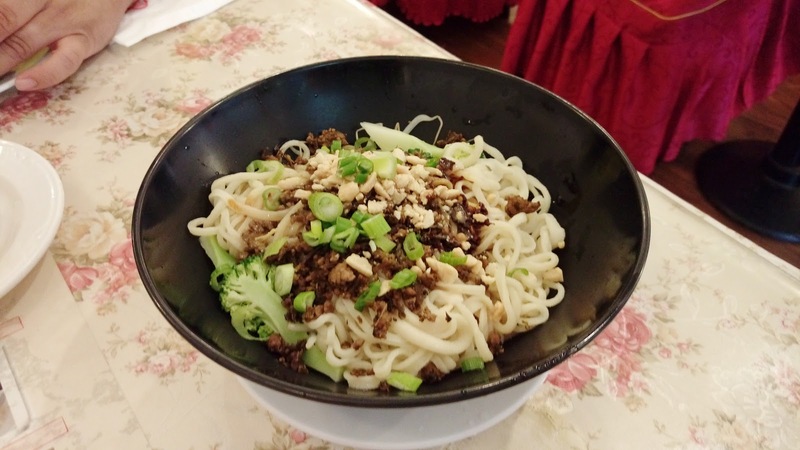 Since we've tried all forms of its handmade noodles, we thought the best fit for this bowl would be the dragging noodles 拉麵. After mixing it thoroughly, each strand of sturdy and chewy noodles carries the savory sauce as each bite is taken. The accompanied vegetables, usually broccoli and bean sprouts, added refreshing crunch to the package. While not very classic nor authentic, the dan-dan noodles here was enjoyable and delightful. Whenever Buddha Boy dines here, or at Dinesty, he always like to order Fried Pork Strips with Beijing Sweet Bean Sauce 京醬肉絲 (known as "Shredded Pork with Hoi-Sin Sauce 京醬肉絲" at Dinesty). While the item names of the two differ, dishes are similar. However, that being said, the version at Yu Xiang Yuan is much more classic because it uses sweet bean paste 甜麵醬 instead of hoi-sin sauce 海鮮醬. So what is the different between sweet bean paste 甜麵醬 and hoi-sin sauce 海鮮醬? Sweet bean paste 甜麵醬 is the fermented result of flour, soy bean and salt. Hoi-sin sauce 海鮮醬 is simply sweet bean paste 甜麵醬 with additional seasonings, such as chili, garlic, vinegar and etc. Hoi-sin sauce 海鮮醬 is only used in Cantonese cuisine, hence why it's so widely used locally due to the large number of Cantonese population. Literally translated as seafood sauce, hoi-sin sauce 海鮮醬 has absolutely zero seafood essence and is never used with seafood. Instead, it's more frequently used as a dip for street food, peking duck or roasted pork. 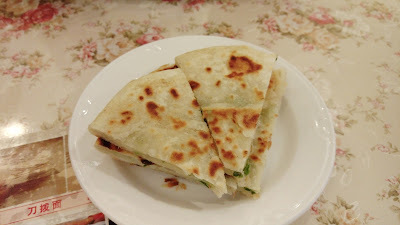 Instead of having the usual crepes, Buddha Boy ordered Green Onion Pancake 蔥油餅 to accompany the plate of shredded pork. While it had a decent amount of scallions, there's not much taste of it. 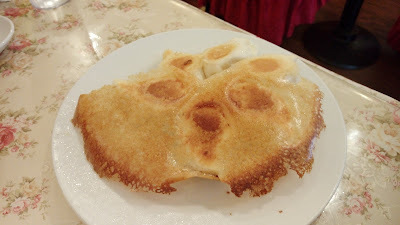 The pancakes were good to eat but were not crispy. I wanted to try something different. Under it's "New Cuisine" menu, I ordered a Pork Ribs in Brown Sauce/Soy Sauce Chop 紅燒排骨煲. 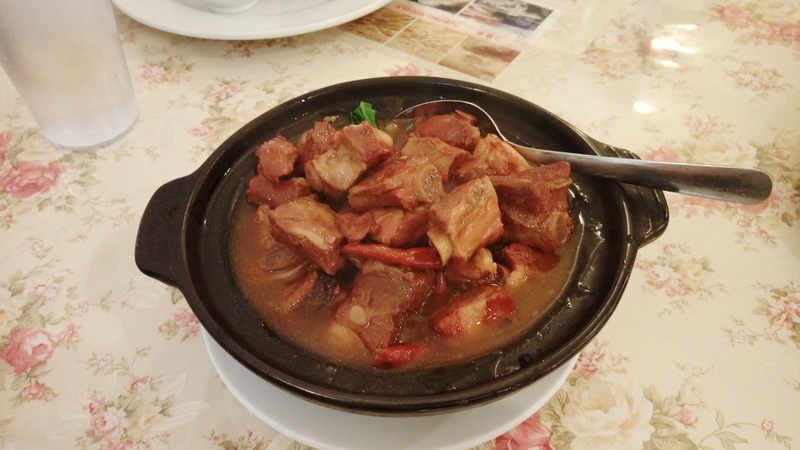 Unlike the usual braise in Shanghai cuisine where it's heavy in salt and sugar, this pot had a soothing tone of sweetness with a mellow braise of soy sauce, rock sugar, ginger, garlic, chili and fermented bean curd. The meaty ribs were tender, but the meat did not have that easy fall-off-the-bone consistency. According to the cover of the menu, an order of fried rice is complimentary with any take-out purchase of over $35.00CAD (before tax). Not exactly sure whether you have the option to choose from the menu, but hey, it's still a pretty sweet deal. Price points for most of the menu items are reasonable. The dining area of the restaurant is decent in size but its kitchen is quite small in terms of ratio. 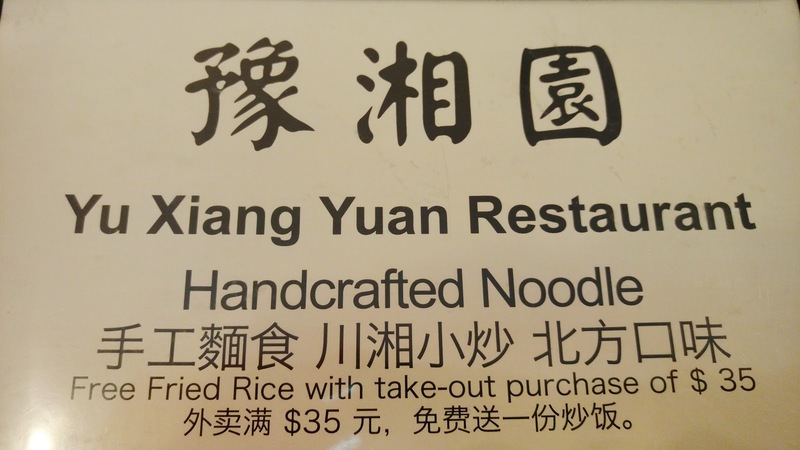 Wait times can be long because most of the items, especially the noodles, are made to order. How's the service? Well, they do try. The kitchen is handled by the parents along with a number of hired helpers while the son manages the front with a hired server.